Guardiola preferred Messi over him and the former Barcelona player slammed the Spaniard. Pep Guardiola’s time at Barcelona brought sweet and joyous memories in the minds of every Barcelona and football fans. For many the squad under Pep Guardiola was considered as the best squad in the history of football. Guardiola during his time at Barcelona won 14 trophies alongside a treble in 2008-2009. However there were few Barcelona players who slammed Guardiola during his time at Barcelona. The likes of Zlatan slammed the Spaniard. It seems this Barcelona players has slammed Guardiola and has claimed it was him that made Barcelona great and not Messi. 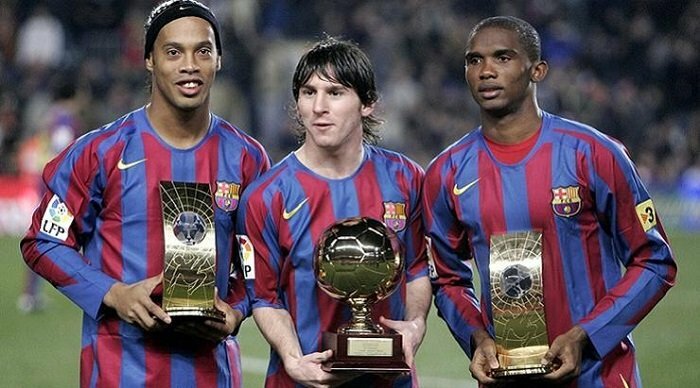 Samuel Eto’o has accused Pep Guardiola of not ‘understanding Barcelona squad’ despite leading them to their first treble in the 2008-09 season. Eto’o had a fall-out with the manager and found regular playing time limited with Guardiola opting to field a young Lionel Messi in what turned out to be his last season at the Camp Nou. Despite the gaffer’s preference, the ex-Cameroon international ended the campaign as Barca’s top scorer in the Spanish top-flight with 30 goals and also scored the opener in their 2-0 defeat of Manchester United in the 2009 Champions League final. While recalling his relationship with the present Manchester City boss, Eto’o revealed that he forced the 48-year-old Catalan to plead for forgiveness with his match-winning displays. “Pep has lived his whole life in Barcelona, but in the years I spent in Barcelona, he didn’t understand the squad. He didn’t live the life of our group,” Eto’o told beIN Sport .“I said to Guardiola, you’ll apologise to me, because it’s me that will make Barcelona win, it’s not Messi. It was the situation back then. Messi would come later, but you can ask Xavi, Iniesta and others, that was my era. It was me that made Barca win, and Pep would ask me for forgiveness.” Following Barcelona’s historic treble win in the 2008-09 season, Eto’o was dropped for a swap deal involving Zlatan Ibrahimovic and later made a move to Inter Milan in July 2009 where he won another treble with the San Siro outfit in his debut season. The move, according to the 38-year-old was the ‘best deal in football history’ as he went ahead to notch 53 goals in 89 games for the Nerazzurri. After stints at Barcelona and Inter Milan, the four-time African Footballer of the Year has since played for Anzhi Makhachkala, Chelsea, Everton, Sampdoria, Antalyaspor, Konyaspor and currently plies his trade at Qatar SC where he has netted five goals in 16 outings in the Qatar Stars League. 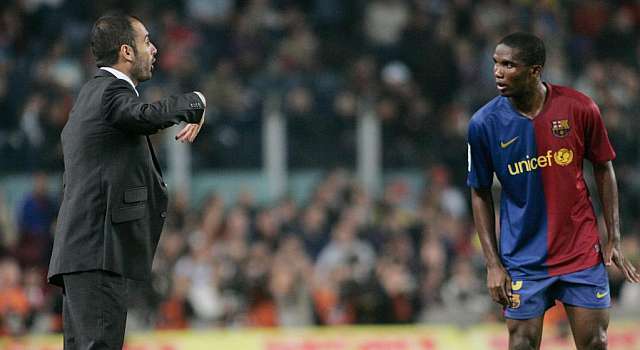 It seems Eto’o has again re-ignited the feud with Pep Guardiola. Eto’o didn’t take Guardiola’s decision of selling him in the correct way. He did play a part in making Barcelona but he shouldn’t take the sole responsibility of making the club great. Monchengladbach wants Eden’s sibling to choose a transfer for Anfield over their Rivals. Masimiliano Allegri reveals the one Ajax player that was unstoppable.